If you have to do laundry every day, you might as well create a beautiful space for it! 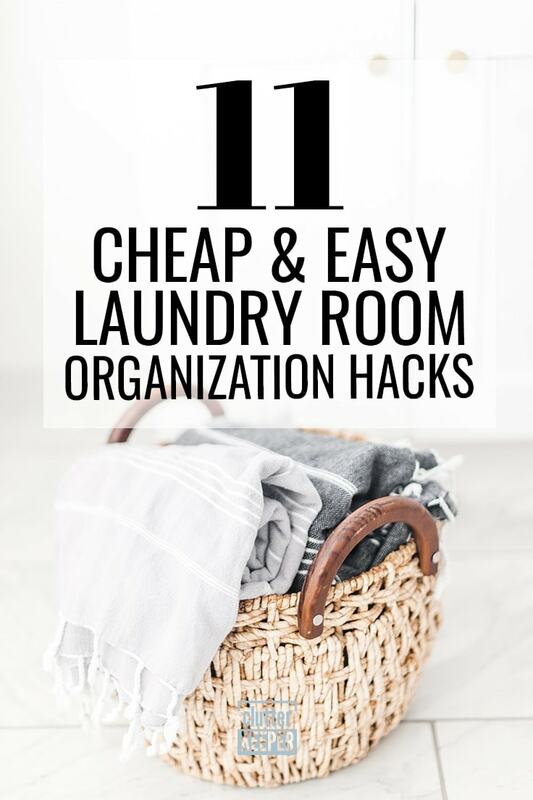 Every single one of these laundry room organization hacks will transform a place for chores into a place for peaceful escape. Pick any one of the following ideas to learn how to organize your laundry room on a small budget. The small changes you make in your laundry room will make a big difference. It doesn’t take a huge budget, or a home decorator to re-decorate your laundry room. Anyone can do it. Even if you aren’t super creative, these ideas are simple. As you browse these ideas, consider upgrading your space. If you have room, invest in decorating it so it is a place you want to be, not a place you have to be. How do you easily organize a small laundry room? Utilize the dead space. Most dead space that is underutilized in a laundry room is above the washer and dryer or next to them (in between the appliances and the wall). If you have enough space, you can create a sorting area for clothes. There are 2 popular ways to do this: on a shelf above the machines, or in a cabinet next to them. The first (and easiest option) is to simply install a shelf above the washer and dryer that is about 18 inches deep so it can hold plastic laundry baskets. Another idea is to create a DIY hamper unit next to the washer or dryer. Since most plastic laundry baskets are about 12 ½ inches tall, you’ll need to make it at least 40 inches tall. Then, you just need to create a sort of open cabinet (without shelves) and install shoe moulding inside your plywood box. Hoosier Handmade has a fantastic tutorial that is so easy anyone can do it. Closet rods are fairly inexpensive and provide a simple solution for laundry room organization. You can put the closet rod on any wall in your room, allowing you to hang up any important clothes. 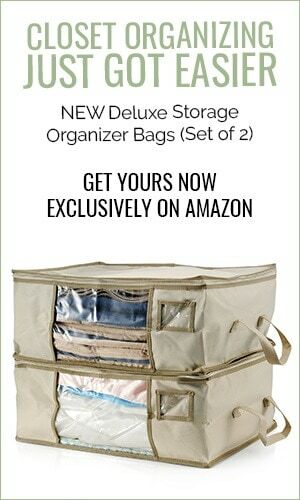 Plus, when you hang up the clothes, it looks so much neater than baskets of clothes cluttering up your space. Whose turn is it to do laundry? Don’t you just hate it when you try to go put a load in the wash, only to find out there’s already one washing? Clear up the confusion with a calendar that outlines the schedule for the machines. 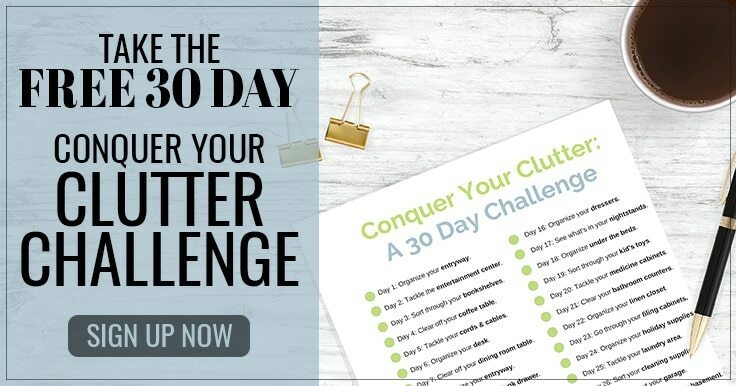 This can be as simple as a wall calendar that you keep updated and change every month. Or, you can even go all-out and use chalkboard paint to artistically announce who has laundry on which days. One of the most underutilized spaces to organize a laundry room is behind the door. So much can fit in organizers that hang behind the door. You can place laundry soaps, brushes, even containers to hold “lost and found” items. Using this space wisely frees up room elsewhere. 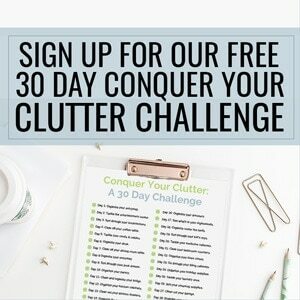 It also cleans up the clutter so you feel like you can breath. Do you still iron your clothes? If you do, then there are some simple hacks for creating an ironing center in your laundry room. Hang up the ironing board and make it so it folds down when you need it. You can also hang the iron up on the wall to have it out of your way until you do need it. You know that loose change you always find at the bottom of the washing machine? (And every other little thing that falls out of pockets?) Well, there is a really lovely storage solution – buckets! In fact, Bowl Full of Lemons has a tutorial for a lost and found buckets hack. You could use this idea for storage solutions in other rooms too – like the bathroom or by your command center. Another place people hardly ever think to use for organization is the ceiling. If you suspend a ladder horizontally from the ceiling (or angle it from the wall) you will have a handy drying rack. You will really like what One Creative Mommy did. She painted a ladder and hung it from the ceiling. The painted ladder adds another dimension of color to the room. Hanging it from above means there is more space for everything else! Sure you can buy floating shelves, but you can save even more money if you make DIY floating shelves. Four Generations One Roof has a tutorial anyone can follow for simple floating shelves. You can use whatever wood you want. If you choose to use Pine (because it’s the least expensive choice) just understand that Pine is a very soft wood and will scratch/dent easily. Adding color to your laundry room will brighten it up and set the mood for the happy place it should be. So paint the shelves a bright white and fill them with pops of color – from baskets to ribbons. Do you use powdered laundry detergent or other additives? Then create some pretty tags for clear canisters. Because I’m Addicted shared this idea and it is fantastic. Branded boxes can honestly clutter up a space. But clear jars or canisters are easier on the eyes and give the appearance of order and tidiness. Finally, if you have a front loading washer and dryer, you will create the appearance of more space if you install a counter on top of them. A counter on top of the washer and dryer will also give you more room to fold your laundry and store things like the clear canisters and pretty baskets mentioned above. All it takes is some carefully measured plywood, paint, and a slab of whatever type of countertop you want. There are a lot of free tutorials online. Down Home Inspiration has one that you can make for less than $40! What are your favorite ways to organize a small laundry room? Laundry room organization is incredibly important. Make your chores a time of peace instead of annoyance. Creating a clutter-free space is exactly what you need.